Newt Gingrich’s poll numbers have plummeted in Iowa. Due to the constant barrage of negative ads from racist Ron Paul, Mitt Romney, and his Super Pac: Restore Our Future, the professor finds himself in third place behind Paul and Romney (1st and 2nd respectively). 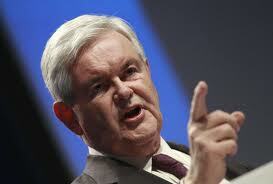 In an angry statement Gingrich exacerbated, “They ought to be ashamed of themselves! Take this junk off the air! Don’t hide behind some baloney about not having control over them!” Newt also mentioned that the Super Pac Restore Our Future is run by 5 of Mitt Romney’s friends. Now, let’s get this straight. Newt Gingrich doesn’t like Super Pacs being used against him. Therefore he doesn’t agree with the Supreme Court decision Citizens United vs. Federal Election Commission; making corporations people, where money equals speech. Just recently he said, “Activist judges should be thrown out. They should be called before Congress to explain their decisions.” And like a good Republican, he took it one step further. He stated that any judge who was uncooperative should be arrested by the Federal Marshals and forced to appear. In this country, what are the odds Uncle Thomas would be the first to go? One down, four to go Newt? … Newt?